A NY Times op-ed today, "Is Harvard Unfair to Asian-Americans?" by Yascha Mounk suggests that the answer to the question is yes, Harvard is unfair, or at very least opaque. Based on the circumstantial evidence that Asians are a flat share of undergraduates for 20 years, despite the fact that Asians are "the fastest-growing racial group in America", there seems to be a quota for Asian applicants at Harvard. If so, it would be reminiscent of the quota in place for Jews in the 1920s-1950s. The topic of the admissions process to Ivy League colleges is of intense interest to Americans. The most-read article in the history of the New Republic was one in July this year on this subject, questioning the process. The op-ed takes us back to Harvard President A. Lawrence Lowell, who warned that the "Jewish invasion" of Harvard College in 1922 (when Jews were 21.5 percent of freshmen, three times the rate at the turn of the century), would "ruin the college." He wanted the Jewish quota to be 15 percent. The faculty objected, so he imposed a de facto cap on Jewish admissions by taking sports and character (and geographical distribution) into account in the admissions process that was pursued into the 1950s. Our Harvard class elected the first African American Class Marshal–Haywood Burns. Affirmative action for Catholics, if that is what occurred, was overtaken in the 1960s by a realization that Harvard should participate in affirmative action for African Americans. This in turn was overtaken by the huge upheaval when women pressed for equal status. The Harvard Class of 1963 was the first to offer Radcliffe students a Harvard diploma. The same objections to women were raised that had been raised about Jews. The quota today, I suggested in my letter, was applied to Asians. I frankly doubt we will voluntarily get much more transparency about the process currently in place– the choices are too difficult and controversial–but we might get more transparency about the past and about the process, which will be helpful in addressing the issues being raised today. Meanwhile, an advocacy group has filed a law suit against Harvard for discriminating against Asians. The Economist doubts it will win, but if it makes a good case it may lead to changes in policies of Harvard and other Ivy League colleges–if not changes in the selection criteria and process, then perhaps more disclosure of the criteria. The dark blue areas have seen significantly higher personal incomes in 2013.
closer to the national average increase of 1.3 percent. 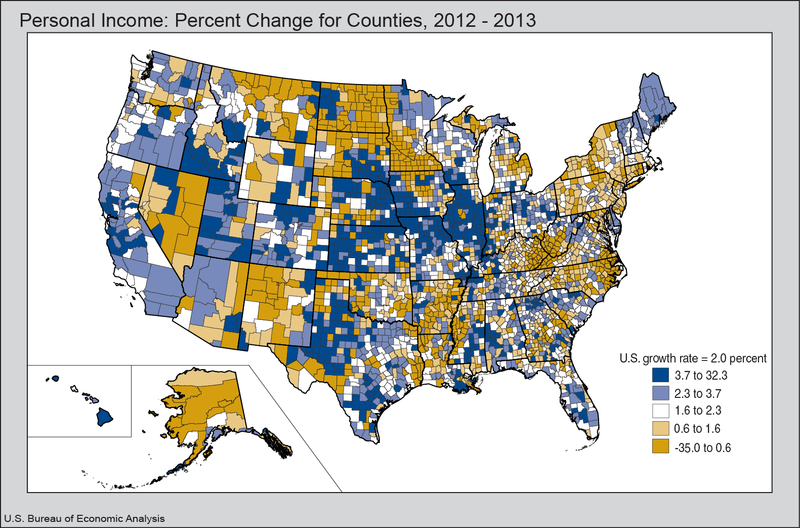 Personal income data by county for 2013 were just released by the Bureau of Economic Analysis. Of course, the numbers being for the year 2013 when it's nearly 2015, the reaction could be: Ho hum. But the delay is made up for by the reliability and importance of the numbers. They provide a good comparative look at the counties. Personal income data by county tell us how their neighbors are doing over time and relative to the rest of the country. The Bureau of Labor Statistics numbers on jobs and unemployment are released faster because we agree to suspend disbelief in our eagerness to have the data in our hands. The BLS tries to adjust the data to mask the variability of the data resulting from seasonality and small sample coverage in the household survey. The BEA's per capita personal income numbers by county are closer to a final answer to the important question: "How are we doing, money-wise?" Some regional data are in the table below, abbreviated to make it easier to talk about and handle (the full table is at www.bea.gov under "Regional"). The top line is the summary for the United States. Per capita income grew from $42,332 in 2011 to $44,765 in 2013. There was quite a jump between 2011 and 2012, 4.4 percent, but the increase between 2012 and 2013 was less than one-third the rate, 1.3 percent. Knowing that the country as a whole had a spurt of personal income in 2012 and then fell back to a lower rate in 2013 helps interpret how each state and county was doing. The states vary considerably among themselves and between years in the change in their share of the increased income. Arkansas jumped 6.8 percent in 2012 and then rose only 0.8 percent in 2013. The District of Columbia actually saw a loss of per capita income in 2013, but at $75,950 in 2012 that was a loss from a high base. The variability is even greater among counties. Indian River County (Vero Beach) saw its per capita income grow 5 percent in 2012, but then it declined in 2013. Palm Beach grew 4.8 percent from its high base of $57,252 and kept growing in 2013 at the national rate of 1.3 percent. 1. Per capita personal income was computed using Census Bureau midyear population estimates. Estimates reflect county population estimates available as of March 2014. 2. Percent change was calculated from unrounded data. The New York State counties are interesting. The average incomes confirm the reputation of Manhattan (New York County) as dwarfing neighboring county incomes. The next-highest skip over the "Outer Boroughs" and go to Westchester, Nassau, Putnam, Suffolk and Rockland counties in New York State and a similar group of high rollers in New Jersey. Westchester saw a big 6.9 percent leap in personal income in 2012, but it and Rockland both saw a small decline in per capita incomes in 2013. Notice the oddly high variability of per capita income in Steele County, ND. A 45 percent increase in 2012 and a one-third decrease in 2013. However, the explanation is simple. The total population of the county is under 2,000 people, so a few families with highly correlated incomes - for example, all dependent upon revenue from the same oil well - could skew the county numbers.